"Thanks for taking the call. I'm Mike Hayden, the [Director of the Central Intelligence Agency]. We each have our job to do in the defense of the Republic. How you are about to do yours is going to make it harder for me to do mine. Can we talk?" That, General Hayden told a gathered audience in Washington DC, is how he used to begin conversations with reporters whenever they were about to run a news story that would disclose a sensitive national security program. An event at the Newseum Friday, Criminal Law, National Security, and the First Amendment, gathered seasoned journalists, national security policymakers and academics to discuss the historical and current tension between national security and the freedom of the press enshrined in the First Amendment. The tension between the American government's need to protect classified national security programs and the public's "right to know," can be traced at least as far back as World War II. In 1941, the Chicago Tribune revealed a top-secret war plan to invade occupied Europe. The 1971 release of the Pentagon Papers by the New York Times led to a historic Supreme Court decision authorizing the publication of articles tracing three decades of U.S. involvement in Vietnam. Fast forward nearly four decades, throw in 24/7 news media and the blogosphere, and the tension has reached a crescendo. The past decade has seen the revelations of mistreatment of detainees at Abu Ghraib, the Warrantless Wiretapping Program, the Terrorist Finance Tracking Program, and over a half million government documents regarding the Afghan and Iraq wars by Wikileaks, among others. Considering these disclosures, Hayden posed the following question: "Can [the CIA] survive as a secretive espionage service?" The collected experts addressed this and many other issues over the course of the day-long conference. Participants were eager to offer explanations for an increase in leaks and reporting on classified programs. Among the causes, according to the media participants, such as Michael Isikoff, are over-classification, selective declassification, and the absence of effective alternatives for whistleblowers. "Over-classification and misclassification breeds abuse," explained Gabriel Schoenfeld, a senior fellow with the Hudson Institute. But, Schoenfeld went on to say, that doesn't justify the leaking of critical national security programs. He pointed to a recent report by the Times which suggested that American hikers captured by the Iranian's may have been sent by the American government—a story which arguably put the remaining two hikers in danger as they face trial in Iran. 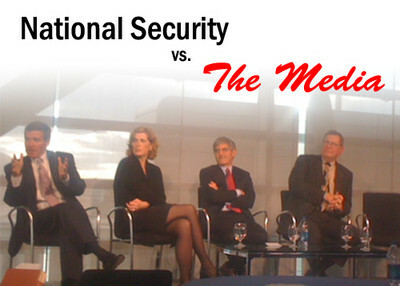 Reporters—"the keepers of the First Amendment," in the words of moderator Abbe D. Lowell—have a responsibility to balance the interests of U.S. national security with the needs of a free press. Jeffrey H. Smith, former CIA general counsel, argued that the only way to do that is for the government to tell the press as much as possible and explain to them why some stories would endanger Americans. Hayden echoed this call. "The intelligence community cannot survive without a free press." To that end, both men told of how they had, during their careers, revealed additional classified information to reporters in order to convince reporters and editors not to publish a news story. These encounters, they explained, were often successful. Walter H. Pincus and Mark Mazzetti, national security reporters for the Washington Post and the New York Times respectively, presented a picture of a media that is largely responsible and equally concerned over the release of sensitive information. They agreed that most journalists often self-police, but that there is no uniform standard for how a news agency goes about publishing a story on classified programs. Panelists also discussed efforts at curbing the unauthorized disclosure of classified programs. Lucy Dalglish, the executive director of the Reporters Committee for Freedom of the Press, explained that no reporter has even been prosecuted for running a story based on classified information. That doesn't mean, however that the government has done nothing in response to increased disclosures. To the contrary, the Obama Administration has prosecuted more leakers of classified information than all previous presidents combined. In the future, participants appeared to agree that new media platforms and the changing nature of military conflict will force both the government and the media to adapt. "Disclosing troop movements is so 20th century," Hayden explained. "What wins in this war is the intelligence, not the firepower." Al - Media, the new intellegence arm of Al-Qaeda. The US intelligence services knew of the Pakistan's ISI planned attack on Bombay before the event and Indians are now coming to know of it because of the US press. So could the General explain when was he planning to let India know of the attack and the mastermind's real identity?